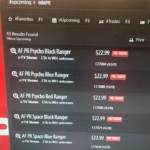 Our site sponsor BigBadToyStore.com has dropped us a line to let us know the highly anticipated Legacy Power Rangers In Space Psycho Rangers, along with the Legacy Dino Thunder White Ranger, are now available for pre-order on the website! These are estimated to arrive later this month! 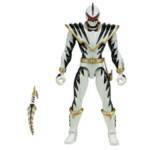 On top of that, the Legacy Psycho Silver Ranger, previously exclusive at San Diego Comic Con, is also available to order! Don’t pay middleman or scalper fees – get it for the same price from the show! Don’t forget to take advantage of the PILE OF LOOT shipping option, combining multiple orders in to one shipment with a flat $4.99 fee! You cannot beat that. Check out BigBadToyStore.com today! Some more press photos have emerged for the upcoming Legacy Power Rangers figures. 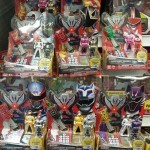 The Psycho Red, Psycho Blue, and Dino Thunder White Ranger are all shown with official press photos. 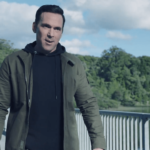 These are expected to be the second-to-last series released by Bandai America before the end of their licensing agreement with Saban Brands. These figures are considered part of Saban Brands‘ 25 for 25th celebration, indicating that they are part of the 25th Anniversary of Power Rangers Celebration. It should be important to note that these are press photos done off painted figures and do not necessarily reflect the actual look of the figure that will be released. These images come courtesy of Smyths Toys Store UK. Before we look at the Power Rangers Dino Thunder B assortment of Ranger Keys, please take a moment and check out our previous Ranger Key galleries! 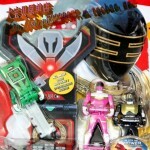 The Power Rangers Super Megaforce – Power Rangers Dino Thunder Ranger Keys Set B set comes with three different Ranger Keys – a translucent Dino Thunder Red Ranger, a translucent Dino Thunder Black Ranger, and the Dino Thunder White Ranger. To have a complete set of Power Rangers Dino Thunder Ranger Keys, you’d need to pick up the Legendary Morpher Gift Set, which came with the Dino Thunder Yellow Ranger in a 20 Ranger Keys assortment. There was no key created for the Dino Thunder Triassic Ranger, mostly because it was a power-up form (although it would have been pretty awesome to get one). To check out the entire gallery of 25 images, click here or on the “Discuss” link at the bottom of this news post! Did you pick up this set? Do you even want to? What do you think of the Sparkle Tommy Ranger Key? Sound off in our discussion thread!